Mom, Dad, the Circus is in Town! Cirkus Arnardo returned to Molde yesterday in their 67th season of business. 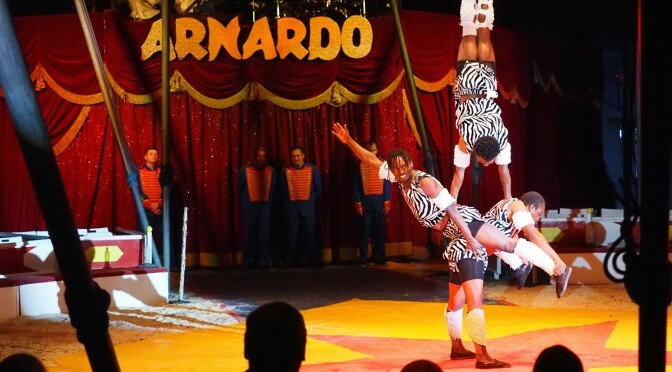 Of the three circuses in Norway, Arnardo is the only one on tour this year. At about 300 kroner per person, a trip to the circus will cost around twice what going to the cinema would. With the exclusion of circus mainstays such as elephants, sea lions, and other wild animals, the unfortunate question of whether circuses are still viable entertainment had to be raised. The children were lined up waiting for the gates to open. They were quite literally jumping with joy. When finally allowed in, a rush for circus classics such as cotton candy and light-up toys ensued. The smells of popcorn and horses in the air brought back nostalgic feelings to anyone whose parents had taken them to the circus when they were younger. When asked about his goals, circus director Are Arnardo was quick to answer. “I want to keep the same feel from when my grandfather ran the show.” Though Mr. Arnardo cites a few modernizations, such as social media advertising and online ticket sales, the old-school circus feel was alive and well inside the tent. Se more photos on Panorama’s Facebook-page. New attractions have been introduced as well. At one point, a Danish “professional pickpocket” took the stage, announcing that he was worried some of the audience members might be missing some of their personal belongings. He then proceeded to walk through the stands and return cigarettes, mobile phones, wallets, and keys to his unsuspecting victims. While it may not be the optimal entertainment for a date night, it was quite apparent that the family environment still makes it a wonderful place to take your kids.